The holiday season can be great for older adults, regardless of their limitations. They get to spend time with their family and friends, participating in activities that bring them joy. Here are some of the things family caregivers can do with an elderly loved one on Christmas. Participating in artistic holiday activities can have a positive impact on the lives of seniors while keeping their minds busy and giving them a sense of purpose. When creating Christmas wreaths, your parent will need to use problem-solving skills and creativity. Completing the wreaths may bring feelings of accomplishment and satisfaction. Making crafts can also boost cognitive abilities, concentration, and hand-eye coordination. The best part of this activity is that your loved one doesn’t have to be too artistic. There’s no right or wrong way to make the wreaths because everything comes down to preference. If your loved one has cognitive, coordination, or concentration difficulties, living alone at home may be an increasing challenge. Aging in place can present a few unique challenges for older adults. Some only require part-time assistance with exercise or meal preparation, while others are living with serious illnesses and benefit more significantly from receiving live-in care. Sacramento, CA, Home Care Assistance are leaders in the elderly in-home care industry for good reason. We tailor our care plans based on each senior’s individual needs, our caregivers continue to receive updated training in senior care as new developments arise, and we also offer comprehensive care for seniors with Alzheimer’s, dementia, and Parkinson’s. Coming together with others in the community is necessary for seniors because it gives them a sense of belonging. Being surrounded by friends and neighbors can enhance communication skills while alleviating feelings of boredom, anxiety, and depression. Some places that generally have light festivals include zoos, parks, aquariums, and botanical gardens. Many of these light festivals have fun activities seniors can participate in, such as ugly Christmas sweater contests, games, and concerts. Giving back can lift a senior’s spirit, making him or her feel accomplished and stimulated. There are a variety of organizations that look for holiday volunteers, such as soup kitchens. In addition to volunteering, you and your loved one can donate to charity. There are toy drives, homeless shelters, and animal organizations he or she could donate items to. These groups then pass the donations out during the Christmas season, making someone else’s holiday a little brighter. Help your loved one look for nonprofit organizations, and choose an activity you both can volunteer for. If your senior parent wants to continue volunteering throughout the year but finds it challenging to get up and go out independently, help is available. Sacramento senior care experts are available to provide high-quality care to seniors on an as-needed basis. From assistance with mobility and exercise to providing transportation to the doctor’s office and social events, there are a variety of ways professional caregivers can help your aging loved one continue to live independently. Invite all of your family over to celebrate the holiday with your parent, and decorate the home with Christmas trees, centerpieces, garland, and more. After dinner, you can all open gifts and take turns sharing special stories with one another. The objective is to give your loved one a holiday surrounded by friends and family and build strong connections. When cooking the holiday meal, make sure your loved one is included in the preparation. He or she can help you make traditional holiday recipes and pass them down to your children and other family members. 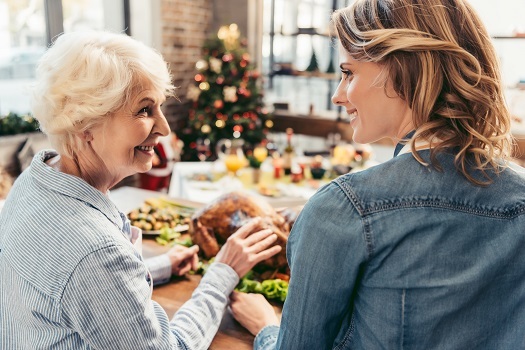 Asking your loved one to host the Christmas dinner and prepare the games or meals could make him or her feel valued and appreciated, which could lead to better mental and emotional health. Many people look forward to the Christmas season with excitement and anticipation, and your loved one can be one of those people. Including him or her in the family festivities is a wonderful way to bring the family together and celebrate the true meaning of the holiday. It’s important to make sure your loved one is happy and healthy the rest of the year, too, which might involve getting a bit of help with daily tasks so he or she can age in place safely and comfortably. Sacramento home care experts are available to provide high-quality care to seniors on an as-needed basis. From assistance with mobility and exercise to providing transportation to the doctor’s office and social events, there are a variety of ways professional caregivers can help your aging loved one continue to live independently. Home Care Assistance can be your trusted partner when your loved one needs help with the challenges of aging. Call us today at 916.706.0169 to learn about our high-quality in-home care services.